The shoulder joint is a ball-and-socket joint. The ball is the top of the arm bone (the humerus), and the socket (glenoid fossa) is part of the shoulder blade (scapula). The shoulder joint is an amazing joint in that it allows more mobility than any other joint in the body. When shoulder joints have problems, including arthritis and fractures, both pain and disability can occur. There are a number of situations that may require all or part of the shoulder to be replaced. The most common is shoulder arthritis. Arthritis can cause the smooth cartilage lining of the shoulder joint to wear away, exposing the bone. Shoulder arthritis is often painful and limits shoulder function. The other common reason to replace a shoulder is a shoulder fracture. Often when the bone around the shoulder joint is broken, the best option is to replace, rather than try to repair the bone. This is especially true when the fracture is in multiple pieces and in older patients. 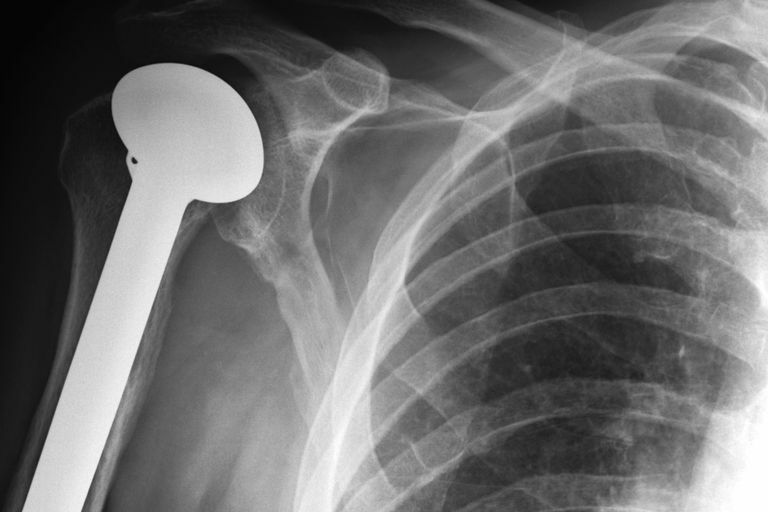 A shoulder hemiarthroplasty is one of the options to consider when treating these conditions. Determining the best surgical option depends on a number of factors, including the diagnosis, the patient's age, and the activities the patient expects to be able to perform. A hemiarthroplasty is a replacement of half of the joint. The word arthroplasty means to replace the joint, and by adding hemi, this means to do half of the replacement. Some people also describe the surgery as a partial shoulder replacement. There are several options to consider when replacing a shoulder. Total Shoulder Replacement: A complete shoulder replacement is usually performed for severe arthritis of the shoulder joint. Some surgeons shy away from doing a full shoulder replacement, as getting the socket to work well and last a long time can be difficult. These surgeons may choose to perform a hemiarthroplasty, in hopes of providing a more predictable result. On the other hand, surgeons who favor total shoulder replacement argue that you are only treating part of the problem by only replacing the ball, and results are less likely to be as good. Reverse Shoulder Replacement: A reverse shoulder replacement is a newer procedure being used to treat a difficult problem called a rotator cuff tear arthropathy. This problem occurs when there is shoulder arthritis as well as a rotator cuff tear. Normal total shoulder replacements are designed to work with a normal rotator cuff and may cause problems without a good rotator cuff. The reverse shoulder replacement was designed for that issue. Shoulder Hemiarthroplasty: The shoulder hemiarthroplasty is most often performed for one of three reasons. The first is an arthritic shoulder where the socket is not in bad condition, but the ball needs to be replaced. The second is in rotator cuff tear arthropathy, where a total should replacement would likely fail over time. Last, is a proximal humerus fracture, where there is too much damage to repair the ball, but the socket is not damaged. The parts of a shoulder hemiarthroplasty look identical to a half of a total shoulder replacement. There are different sizes and different brands, but they all work similarly. The stem of the implant is inserted in the hollow center of the arm bone. It can either be held in place by being wedged tightly or cemented in position. The ball is attached to the top of the stem. The advantages of the hemiarthroplasty when compared to a complete shoulder replacement include a less-invasive surgery and no risk of problems with an artificial socket. The disadvantage is that if a worn-out socket still causes pain in the shoulder, a second surgery can be necessary to convert to a total shoulder replacement. Risks of a shoulder hemiarthroplasty include infection, nerve injury, dislocation of the shoulder, and persistent pain. Wiater JM and Fabing MH. "Shoulder Arthroplasty: Prosthetic Options and Indications" J Am Acad Orthop Surg July 2009 ; 17:415-425.